Mayor Rahm Emanuel introduced new ethics reforms which would explicitly prohibit some of the very same behaviors that Ald. Ed Burke (14th) is accused of engaging in. 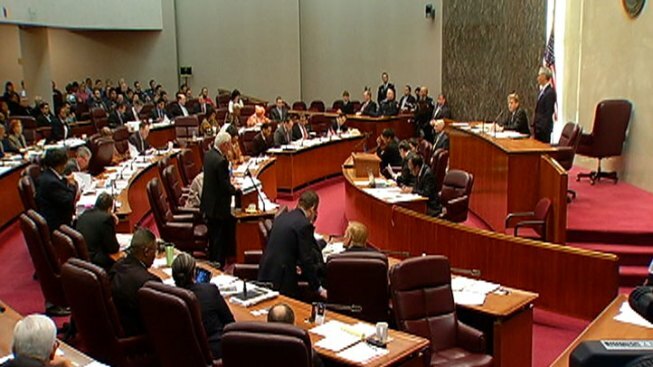 Emanuel introduced the ethics package, his fifth since 2011, at Wednesday’s City Council meeting. A coalition of aldermen also took the opportunity to introduce their own ethics package. Among their propositions are creating a committee to provide the City Council with independent policy analyses, making sure committee staff do work only for their committees and requiring City Council to have a regular meeting schedule. “I’m happy to see that there’s going to be changes, and they have to be pretty severe for the council and for the fifth floor,” said Ald. Scott Waguespack (32nd). “The fight for reform is never easy, and I’m glad that we may have a chance to actually push through some of these reforms now,” said Ald. Michelle Smith (43rd). Emanuel’s proposed changes would require committee chairmen with more than three conflict of interest disclosures per year to terminate the relationship that caused the conflict. If they don’t comply, they will either have to resign new or be subject to fines of $500-$2,000 for each offense. Burke recused himself from 464 votes since 2011 because of conflicts of interest since, more than all other aldermen combined, the Better Government Association reported. The new ordinance would also require the Committee on Zoning, Landmarks and Building Standards to vote on zoning amendments within 180 days after receiving an application to prevent them from getting indefinitely lost in committee. In an apparent response to the allegations that Burke held up requests for a driveway permit until the applicant, fast-food franchise owner Shoukat Dhanani gave over his legal business over to Burke’s private law firm, Emanuel also proposed changes to the way driveway permits will be issued. The proposed changes would provide aldermen the opportunity to submit written concerns about the effects of a driveway on traffic or public safety to the commissioner of the Department of Transportation and would require the commissioner to keep the objections on file. The same opportunity would be provided to alderman for building permits under the proposed changes. Emanuel said he wants to pass an additional “comprehensive” ethics reform package before leaving office. The mayor dismissed the idea of an outright ban on outside employment for aldermen, saying that it is valuable to have input from aldermen who own small businesses. While he admitted to sometimes being frustrated by aldermen exercising their aldermanic privilege, he said it doesn’t mean he believes aldermen should be “neutered” by fully revoking that power.